birds : The mid-summer lull is upon us and I haven't been specifically looking for birds. The Buzzard slowly flapping over the house cricket competition was a pleasant highlight. moths : Took the moth trap to school to show the year 8 class and most were pretty amazed by the Privet and Poplar Hawk-moths and the Buff-tips looking like sticks etc. It wasn't a massive catch but it included another Marbled White Spot, my 4th in the last few weeks - another species that has increased recently. 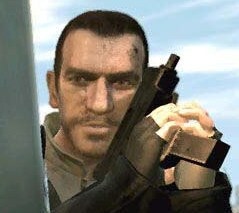 nonsense : My year 9 pupils have decided that I am actually the anti-hero Niko Bellic from the computer game "Grand Theft Auto IV". Apparently I look like him . . .